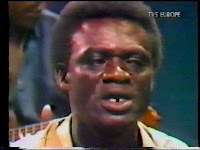 Franco was probably in Europe when the TP OK Jazz was asked to appear in a Christmas show on Zairean television. It was 1986 and he was making plans and laying out the strategy to finally conquer Europe in 1987. Concerts were booked and albums were imagined. Meanwhile, back in Zaïre, the remaining musicians are 'making do' without le Grand Maître*. This clip features a young Malage De Lugendo, accompanied by -amongst others- the composer Lutumba Simaro on rhythm guitar (I just love the bit when he can't resist singing along with his own lyrics), Dizzy Mandjeku and Gerry Dialungana on lead. *I'm just kidding: in fact the orchestra always rehearsed without Franco. It is an absolute classic, incredible guitarskills, wow !